Designed for rolling, tumbling and general gymnastic activities, these hard wearing mats are constructed using 115kg/m3 density chipfoam enclosed in a.. These tough economical all purpose gym mats are constructed from 145kg/m3 high density chipfoam covered in heavy duty flame resistant PVC fabric overl.. Constructed from 225kg/m3 high density chipfoam for areas where a superior heavy duty mat is required for Judo, Karate or other Martial Arts. Covered .. Manufactured from EVA foam these jigsaw mats are easy to assemble and light to handle. Available in two thicknesses to suit a range of activities su..
Light, rigid and easy to use, these lightweight mats are particularly suitable for younger children. Constructed from low density closed cell cross li.. 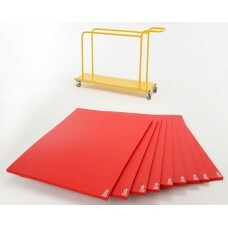 Designed for schools and leisure centres as a general purpose mat. Constructed from 195kg/m3 chipfoam in a green or red Tatami flame resistant fabric,.. Essential for safer landings and building confidence during somersaults etc. Constructed using soft foam encased in flame retardant heavy duty polyest..
As the name suggests these mats are of a sandwich construction with a layer of lightweight closed cell foam offering absorbtion and a layer of chipfoa..
A set of 9 Gym Time mats to complement the Gym Time range of equipment, available with or without a trolley. The sandwich construction..